I can understand the blessing from God that you aren't ready for - our daughter who is a few days older than Kara was that way. It took me almost 2 months to accept that it was God's will and that we could handle being parents now. As for the house hunting - we started that just before we found out we were pregnant. It took us April - September to find a house we wanted AND have a reasonable offer accepted. So many people have their houses over-priced! I will be praying for you and your family! Thank you for updating, but also thank you for waiting until you felt you weren't forcing yourself. (At least I hope that's what you did.) Your health, sanity, and family are what come first, so don't you worry about your fans out here on teh intarwebs. We'll be here waiting, regardless of how long we have to wait between posts. Just take care of yourself and your beautiful family. ah...the housing market. To answer your question, because they can't afford the mortgage (heavy possibility of creative financing) but also can't afford a short sale (or their lender won't approve it). Speaking as a real estate (for the obvious federal agency) attorney, I have to commend you on your sensible course of action. Best of luck-I'm positive the right house at the right price will come along for you soon. I never comment but I LOVE LOVE LOVE that video. There's something about baby belly laughs that just get me. Im a so glad for your Parents gig- otherwiese I would have been worried. I think you are doing fantastic, you are going through so much right now but your working with it. All you need is more time, for all of it really. The first tri,the house hunting, coming to grips with Number Two. I imagine that first day you dont feel like garbage your love affiar will begin:)! Keep your chin up, from my perspective your grass is quite green. Kara is SO adorable! The laughs were just what I needed to put me in a better mood this morning. I wish I had a video camera- I was watching this with my 3 year old nephew (world's best babysitter over here!) and he was laughing so hard. He told me to tell my friend he likes her video. I have a feeling we're going to watch this 87 times today... Good thing you all are so cute! Professor Art Nerd: Luke and I don't have a "real" video camera. We used our regular old Canon! You and Kara are SO CUTE together! And that laughter? Well! The cute awesomeness speaks for itself! Aw, nice to see you're still there! But as mentioned from some others, hope you don't ever feel "obligated". We moms have been there, done that. We understand that exhaustion. This post was so sweet, though. We're all updated now, belly laughs and all. ...point to your belly during one of the "oopsie"s. ha ha ha ha! Oh, and P.S. on the house hunting. Good luck! I know it's frustrating. We've had our house on the market since September, and no one is biting. Or they are, but we can't accept. We will be in the poorhouse if we do. (We're being relocated, so we're being FORCED to sell our house. boo!) So, I know. It's hard on both sides. Hang in there! Oh my goodness, I was reading this morning in the other room, and Grandpa was watching your video. Without seeing the picture, I knew right away that was our beautiful baby Kara, then I heard your voice and Luke's verifying what I had guessed. This video is a treasure. And on the house hunt, I can sympathize with the sellers. We bought our condo in June 2006 and it's currently appraising for about $40K less than what we bought it for. Even with all of the upgrades we have done. It makes me sick! And scared since we're looking to move in a year since our one bedroom condo doesn't have room for a baby. Oy. I don't know who's more adorable in that video -- you or Kara. I think you look great, and I love the way your face lights up with joy in response to Kara's joy. She and Number Two are so unbelievably lucky to have you! I don't think there's anything better than hearing a baby laugh like that. That video was awesome! Megan and I watched it twice and she was totally copying Kara's laughing! that is the best laugh ever! she is adorable! my brother used to laugh like that in his sleep when he was a baby. so cute. that's awesome that you guys caught it on camera, too. You look wonderful, Kara is precious, and you can just tell from that video what a GREAT mommy you are. :) Loved it. You two have gone a really great video of Kara. She has a "big smart" to learn when to laugh. Wow, Kara's quite precocious to write with such clarity! She's also adorable, and her laughter is fabulous! Keep on keeping on, things will get better and life will settle down. When the right house opportunity opens up, you and Luke will be ready and that's more than a lot of people can say! Also, the 1st trimester will not last forever, so keep your chin up and look forward to seeing your 2nd baby bump soon! Wow. I NEVER comment, but am a frequent blogstalker- glad to see you're back. Good luck with it all! My whole family is laughing right now!! lol okay so now I'M laughing out loud every time you say 'OOPSIE!' hehe Isn't it funny how they find something HIL-AR-IOUS one day, but the next time you do it they're all, 'Whatever Mom. You're so lame.' Maggie did that with 'Duuuude!' One night I had her cracking up at it, but never again since. Kara is just too adorable, and growing up so fast! So, Liz sends me an gmail chat and is all "Please tell me you have see this" and gives me the link. Having no idea what it is, I click on it and am all, hey, I know that kid. Wait, that's Kara. Wait, that's Bree! I'm not sure what i was expecting but what a surprise to hear such a beautiful sound. A little baby belting out a laugh like that can always brighten a day. Thank you for sharing it. Kara is just the sweetest thing. I love that you guys caught this on video. You might feel blech but you look wonderful and happy. Don't stress about the blog. You have a few things going on in your life right now. The most important thing is for you to stay rested and healthy so Number Two can grow, grow, grow. Now, please excuse me while I got watch Kara laugh again. Also, (yes, I had to pause the video to come back and say this) I love how when Luke says "oopsie" Kara's all "A-haa" and then looks at you like come on Mama, give me the goods. And then you say "oopsie" and she loses it again. Nothing against Luke, I just thought that was funny. PRECIOUS video! Love it. Nothing beats a baby laugh. 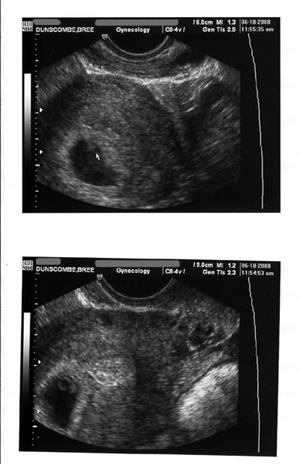 Number Two is a cutie, small as he/she may be. Isn't it amazing that those tiny little dots grow into real, live, laughing little people so quickly!?!? Take care of yourself!!! You're radiant in this video, and I'm not saying that because you have "that pregnant glow"--it looks like you look that way all the time, but it's really evident here, and it's striking. And I think my favorite part of the video is Kara hugging you. That is the most priceless video, oh my goodness. SHE IS SO HAPPY! I love it! Oh my god that video was so great! Glad you came back. We certainly forgive you for feeling BLECH and not feeling up to it. But I admit I certainly DO check everyday. And today when I saw it, YEA! I love baby belly laughs. And isn't it amazing what will trigger them? One night, my nephew belly laughed everytime we slapped the coffee table. Never again after that night, but for that one night, that's all you had to do. That baby is the most adorable thing ever!!! That video is amazing! I couldn't help laughing myself (and now my co-workers think I'm nuts). That is my ABSOLUTE favorite sound in the whole world! There is nothing better than that - And I can only imagine how much better it is when it's your own bebe :-) Amazingly beautiful!! This video made my day and my two year old loved it, too. ("Again! Again! Again! Mama!!!) We can illicit these belly laughs from Keaton by rubbing his inner thigh- he's totally powerless against it and erupts into giggles. And wow Bree- the way you've been describing yourself I half expected a homely bedraggled women but you look wonderful! You may feel icky but you look great and that girl is sure something to be proud of. K will be 7 months tomorrow and he still can't sit up! (I'm not so secretly thrilled about this because mobile babies scare the bejesus out of me but Kara's gross motor skills are very impressive!!) Have a happy 4th!! OMG! The laughing is so CUTE!!!! That video of Kara is hysterical! You may want to consider sending it to America's funniest videos... (is that still on TV?) it could win the extra money you need for the dream house down payment! Or maybe America Express could use it for one of their Priceless video's! Anyways I just loved it! That video was just too friggin' adorable. Your daughter is just SO cute! Oh my! Hi there.. You're lucky to have a pretty daughter. I had fun reading your post! I'm a soon to be mom and my expectant due date is on January 3, 2009. Seems like we're just months apart from becoming mothers. :) Please do visit my site, i'll be posting more pictures like the ultrasounds I had (the fetus really was moving like it's enjoying floating inside me.. it really amazed me.) See you around!